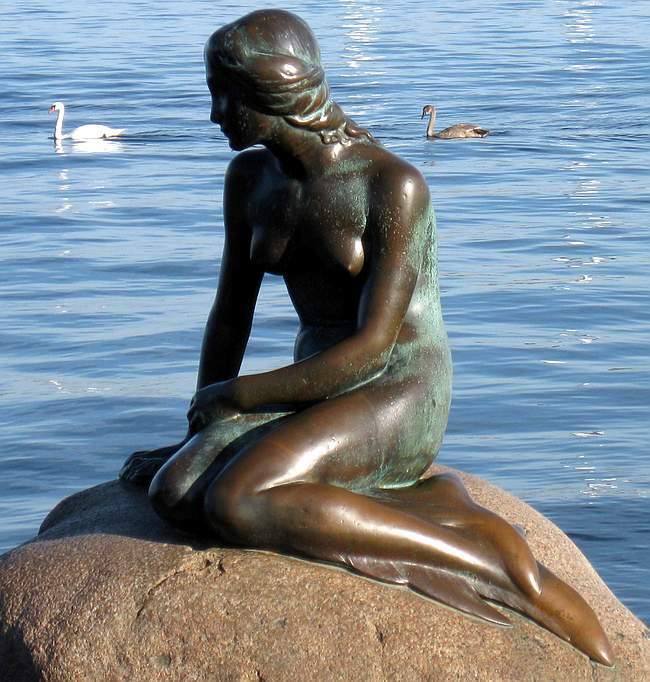 Den Lille Havfrue, or "Little Mermaid" is, of course, the heroine from the Hans Christian Andersen fairy tale, and has become the symbol of København. 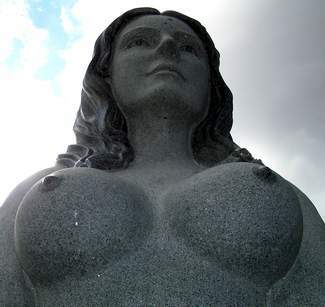 The statue was made at the turn of the century, and has since earned a reputation for getting her head cut off by pranksters. We who live in København also enjoy visiting den Lille Havfrue. Especially on a Sunday, we bicycle out there to sit and watch the hordes of tourists come and go. Swarms of clichéd Japanese with their cameras. Drunk Swedes living it up in a country where they can drink, for a change. Russians are glad just to be anywhere. Americans are especially amusing, usually disappointed & whining "Is THAT all it is?" 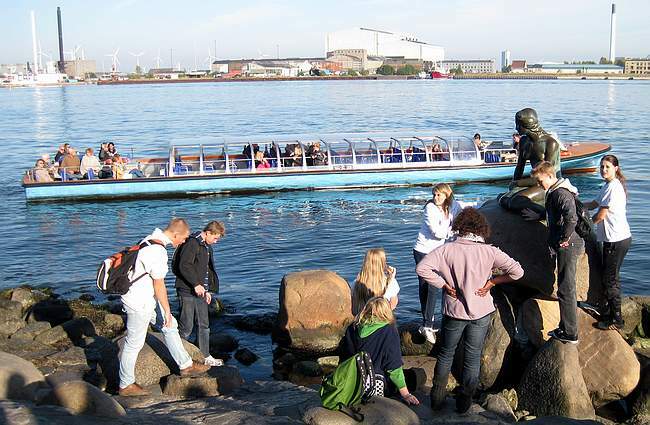 The statue of the Little Mermaid is life-size, y'know-- in other words little, just as named-- so our favorite thrill is to hear yet another American Tourist asking the guide, "When is the Little Mermaid open, and can we go up in it?" 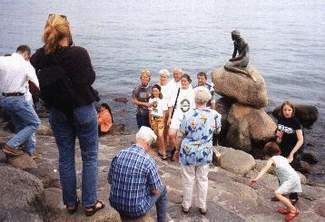 Eventually, someone addressed that problem and sculpted a Big Mermaid, placing it a few hundred meters up the promenade from the original measly little mermaid. And of course, if you're going for big, you may as well make sure it's BIG enough. The grave of Hans Christian Andersen, since we mentioned him, can also be found in Kbh at Assistens Kirkegård.